As part of the fabulous Preston Guild 2012, Vintage Guild Weekend. TEC and JCR Creative co-curated a lively programme of arts & crafts activity across the festival site. 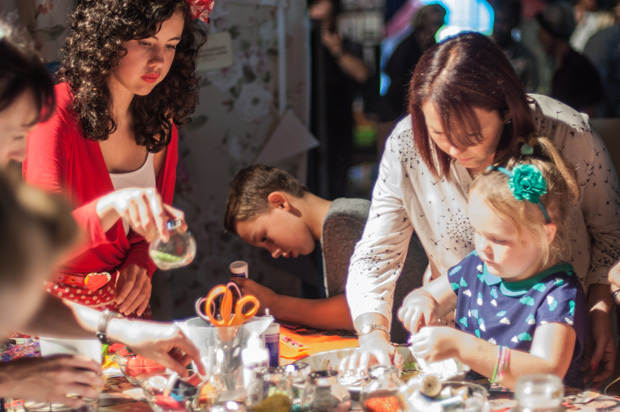 The Fashion & Craft tent hosted a range of creative workshops and activities, featuring Manchester’s Stitched Up – Upcycling collective, The Ministry of Craft, The Harris School for Creative Kids, Art Yarn, Horrockses dress making demos, and Polly the Vintage Caravan. We exhibited a range of vintage inspired wallpaper dresses created by Preston College Fashion students and Graham & Brown; and created a vintage play area taking you back to your youth with retro computer games, space hoppers, hula hoops and all the old favourites. And all over the park we ‘popped up’ a few fun arts and crafts installations, seaside peep boards with a vintage twist, giant bunting on the old railway bridge and yarn bombed plant pots, which all added to the Vintage Guild Weekend magic.